Perfectly clean air and high efficiency are the key to lower costs and improve environmental friendliness. Compressors account for 20 to 30% of factory power consumption. It could thus be said that conserving energy at factory starts with energy-efficient compressors. Today, there is greater demand than ever before for environmental friendliness and lower costs, and as a result, energy saving is the greatest challenge facing compressors. We have worked tirelessly to meet this challenge since we unveiled the water lubricated oil-free compressor which was a world's first compressor mechanism in 1982. These compressors do not need any oil. This eliminates energy loss from oil filters, and reduces waste oil, which is a type of industrial waste. We have also achieved an extremely high operating efficiency by using water as the lubricating medium in our unique compressor mechanism. 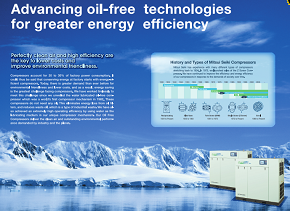 Our Oil Free Compressors deliver the clean air and outstanding environmental performance demanded by industry and the planet.